Pokémon: The Movie 2000[a] is a 1999 Japanese animated fantasy film and the second in the Pokémon anime franchise. Directed by Kunihiko Yuyama, the film stars the voices of Rica Matsumoto, Ikue Ōtani, Unshō Ishizuka, Mayumi Iizuka, Satomi Kōrogi, Tomokazu Seki, Megumi Hayashibara, Shin-ichiro Miki, Inuko Inuyama, Kōichi Yamadera, Chikao Ōtsuka, Kotono Mitsuishi, Akiko Hiramatsu, Takeshi Kaga and Masatoshi Hamada. Pokémon: The Movie 2000 has two parts: the feature presentation and a 20-minute preceding short. The film is set during the Orange Islands saga, where Ash, Misty and Tracey enter Shamouti Island. While there, they discover the three legendary bird Pokémon, Moltres, Zapdos and Articuno. Meanwhile, a collector named Lawrence III attempts to steal the three Pokémon to awaken Lugia, which proves dangerous for the legendary Pokémon, Lugia, and Ash himself. The film was released in Japanese theaters on July 17, 1999. The English version was produced by 4Kids Entertainment and released in the United States by Warner Bros. on July 21, 2000. Pokémon: The Movie 2000 earned less at the box office than its predecessor, Pokémon: The First Movie. As in Pikachu's Vacation, all of the faces of the main human characters are unseen. When Togepi falls down a dark hole, Pikachu, Bulbasaur, Squirtle, Marill, Venonat, and Psyduck give chase and find themselves in a giant tree that once was Pikachu's old home. With help from Pikachu's new friend, Elekid, the Pokémon find Togepi but he has been mistaken for an Exeggcute egg. The Pokémon head off into the depths of the tree to find the missing egg, meeting a trio of dancing Bellossom along the way. A severe storm hits the area and Pikachu and his friends try to protect the Exeggcute eggs from being blown away. The grass Pokémon lend a hand and Snorlax saves everyone with his great strength. The storm fades when a Dragonair appears and calms the storm while a Chansey appears, revealing she had the missing egg all along. The eggs are reunited. Exeggcute suddenly evolves into Exeggutor with the assistance of a Leaf Stone. Pikachu and his friends say farewell to Elekid and the others and head back to their trainers. Meanwhile, Meowth tries to find his way to a campsite but ends up getting caught on Pikachu's mishaps and gives up. Lawrence III, a Pokémon collector, strives to make a legendary prophecy occur. His plan to capture the legendary birds Moltres, Zapdos and Articuno will ultimately lead to the capture of the "Beast of the Sea" Lugia. Lawrence sets out in his flying hovercraft to the heart of the Orange Islands to capture the three legendary birds, referred to as the Titans of Fire, Ice and Lightning. He successfully captures Moltres, but this upsets the balance of power the birds have over the world's climate. Weather across the world begins to go haywire, alerting countless Pokémon to the change. Ash Ketchum and his companions Misty and Tracey Sketchit get caught in a freak storm, and are washed ashore on Shamouti, set in the centre of the Orange Islands. Learning that the island festival celebrating the legend is about to begin, Ash is selected as the festival's Chosen One by a girl named Melody, the festival maiden. At the festival's banquet, Melody explains to Ash he must retrieve three glass balls from each of the legendary birds' islands and take them to Shamouti's shrine, guarded by a talking Slowking, where Melody will end his task by playing the festival's song, actually the song of Lugia. Ash immediately sets out, led by the troubled Pikachu. Taken to Fire Island by sea captain Maren, Ash and Pikachu find Moltres' treasure, but are interrupted by Team Rocket. Misty, Tracey and Melody arrive via Melody's multi-purpose boat, followed by Zapdos who has come to claim the island. Lawrence appears overhead, attacking and capturing Zapdos as well as Ash and co. accidentally. Meanwhile, Professor Oak, Professor Ivy, and Ash's mother Delia Ketchum fly to the islands but their helicopter crashes on Shamouti. Lawrence frees Ash and the others and attempts to capture Articuno, accidentally awakening Lugia in the process. Trying to foil Lawrence's plans, Ash and the others free Moltres and Zapdos who escape and bring down Lawrence's hovercraft. Articuno, Zapdos, and Moltres engage in all out war, trying to destroy each other. Ash and co. manage to escape, gaining Zapdos' treasure in the process, and are transported back to Shamouti by a mysterious water spout revealed to be Lugia. Lugia at first tries to stop the battle himself, but is outmatched by the birds' powers combined against him. Telepathically he then explains the birds and the weather can be stopped by the legend's Chosen One, actually Ash in reality. Ash agrees to go to Articuno's island to get the final treasure, but his progress is halted by the legendary birds. Team Rocket arrive on a speedboat made from a dingy and the helicopter's discarded propeller, wishing to save the world in order to continue their villainy. The group race up to Articuno's shrine and retrieve the treasure, but before they can escape, the legendary birds appear. They destroy the speedboat before Articuno is knocked out by Moltres and Zapdos. Lugia rescues Ash, Pikachu and Team Rocket, but Team Rocket heroically jump into the sea upon realising they are slowing Lugia down. Lawrence tries to catch Lugia, but Lugia uses its Aeroblast attack to destroy his airship and take out Moltres and Zapdos before collapsing into the sea. Misty and Tracey rescue Ash and Pikachu, who venture to Shamouti Island's shrine and place the final treasure with the others. Melody plays Lugia's song, ending the storms and bringing peace to the legendary birds. Lugia rises from the sea, bringing the true Beast of the Sea with him, an underwater current that has been altering the climate. Later, after the birds returned to their islands, Lugia departs after thanking Ash. Delia and the professors arrive. Delia, having witnessed her son's actions, asks him to be more careful which he complies with. Lawrence laments his decisions, deciding to start his collection again. Team Rocket reach the island a day later and are told by Slowking that the audience saw their heroics; the trio contemplates changing their ways but ultimately decide to stay the same when they realize their boss might not like the idea. 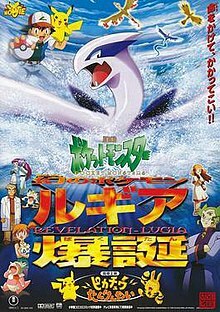 Pokémon: The Movie 2000 was released in Japan on July 17, 1999. An English-language adaptation of the film produced by 4Kids Entertainment was released by Warner Bros. on July 21, 2000 in the United States. Viz Media has announced that a limited edition Blu-ray Steelbook containing the first three Pokémon films will be released on February 9, 2016, along with single releases on DVD (These are: Pokémon: The First Movie, Pokémon: The Movie 2000 and Pokémon 3: The Movie). In accommodation with the 20th anniversary of the Pokémon franchise, a digitally remastered version of the film was released on iTunes, Amazon and Google Play on February 27, 2016. The film was financially successful. It earned $9,250,000 on opening day, which was only less than $1 million behind the opening day of its predecessor. It reached third place for its opening weekend, grossing $19,575,608. On its second weekend it declined 68.3% to $6.2 million and descended to sixth place. It made $43,758,684 at the domestic box office, barely over half of the first film's domestic total. As of 2015, the film is the 88th highest-grossing film in Japan, with ¥6.4 billion. The film made $133,949,270 at the end of its box office run. On Rotten Tomatoes, the North American adaptation of the film has an approval rating of 17% based on 66 reviews, with the website's critical consensus reading, "Despite being somewhat more exciting than the previous film, this kiddy flick still lacks any real adventure or excitement. What it does contain is choppy animation and poor voice acting. Doesn't match up to virtually anything out there." On Metacritic the film has a weighted average score of 28 out of 100, based on 20 critics, indicating "generally unfavorable reviews". Audiences polled by CinemaScore gave the film an average grade of "A–" on an A+ to F scale. Plugged In said that "the plot is as tiresome as it was in the first movie. But the violence is tamed somewhat, so the positive messages shine a bit more brightly". A more positive review was given by Gene Seymour of the Los Angeles Times. Seymour believed that the film "charms without talking down to its audience". He also compared it favorably to the first movie, stating, "...unlike its predecessor, 'Pokémon 2000' doesn't assume that everyone who sees it will know how to tell Togepi from Bulbasaur or Squirtle from Pikachu. Sure, I know now, but I'm not telling because I don't have to". At the 2000 Stinkers Bad Movie Awards, the film was nominated for "Worst Achievement in Animation" and "The Remake or Sequel Nobody Was Clamoring For". However, it lost "Worst Achievement in Animation" to Digimon: The Movie. In Japan, J-pop artist Namie Amuro sang the ending song "toi et moi". A soundtrack containing Shinji Miyazaki's original score for the film was released on September 9, 1999 along with two original songs sung by Rika Matsumoto and Akiko Hiramatsu. For the English dub, Donna Summer sings the closing song, also titled "The Power of One". "Weird Al" Yankovic also provided an original song, "Polkamon", which is played during the ending credits. The last song played during the credits was "Flying Without Wings" by Westlife. Italian singer Laura Pausini sings the ballad "The Extra Mile", written, among others, by Australian singer Tina Arena. The B-52's also recorded the song "The Chosen One" just for the movie. The North American soundtrack was released alongside the film in 2000 by WB's then-sister company Atlantic Records on Audio CD and Compact Cassette and includes many songs by popular artists, such as "Weird Al" Yankovic (who later came into conflict with Atlantic) and The B-52's (once signed to Warner Bros. Records, a sister label to Atlantic), many of which do not actually appear in the film. The film score composed and conducted by Ralph Schuckett was also released on a separate CD, Pokémon: The Movie 2000 Original Motion Picture Score, but this CD still features "The Legend Comes to Life", which was the final song played by Melody. The title track to the film was remixed by Jonathan Peters and Tommy Musto. Pokémon: The Movie 2000 Original Motion Picture Score is the orchestral soundtrack to the movie. The CD was originally released in some countries in Europe (the United Kingdom not included) in 2000. It was not until 2004 that American fans got their chance to own the music, when it became available for download on iTunes. All music composed by Ralph Schuckett. 2. "The Beast of the Sea Stirs"
5. "If Only They Could Help"
6. "The World Turns to Ash"
7. "To the Third Treasure"
8. "Return to the Shrine"
Herman Cain, a former Republican candidate for President of the United States, quoted lines from the Donna Summer song multiple times throughout his campaign. He first used them in his official campaign announcement, mis-attributing them to the closing song of the 2000 Olympics. He made the same mistake at the Republican Leadership Conference in New Orleans on June 17, 2011. During an August debate, Cain again quoted the lyrics, this time attributing them to a poet. In a December interview with GQ, Cain acknowledged that the song came from a Pokémon film, but reiterated that he heard it during the close of the 2000 Olympics and stated that he had not previously known that it had originated in this film. However, "The Power of One" was not played during the Olympics' closing ceremony. During Cain's announcement that he would be suspending his presidential campaign, he again quoted these lyrics, acknowledging that they came from a Pokémon movie. ^ a b c d e f g h Galbraith IV 2008, p. 407. ^ a b c d "Pokemon: The Movie 2000 Box Office Mojo". Box Office Mojo. Retrieved May 30, 2012. ^ "Neil Stewart, Actor". Mandy Actors. Retrieved June 23, 2014. ^ "Resume". Emily Rees, voice actor. Retrieved October 9, 2015. ^ "Resume". The Voices of Michelle Goguen. Retrieved October 9, 2015. ^ "Pokemon: The Movie 2000 Box Office Mojo Daily". Box Office Mojo. Retrieved May 30, 2012. ^ "Pokemon: The First Movie Box Office Mojo Daily". Box Office Mojo. Retrieved May 30, 2012. ^ "Pokemon: The Movie 2000 Box Office Mojo Weekend". Box Office Mojo. Retrieved May 30, 2012. ^ "Pokemon: The First Movie Box Office Mojo". Box Office Mojo. Retrieved May 30, 2012. ^ "歴代興収ベスト100". www.kogyotsushin.com (in Japanese). Kogyo Tsushinsha. January 5, 2015. Archived from the original on February 9, 2015. Retrieved January 8, 2015. ^ "Pokémon: The Movie 2000 Reviews". Rotten Tomatoes. Flixster. Retrieved November 13, 2018. ^ "Pokemon: The Movie 2000 reviews". Metacritic. CBS Interactive. Retrieved January 22, 2016. ^ "Find CinemaScore". CinemaScore. Retrieved November 13, 2018. ^ Seymour, Gene (July 21, 2000). "As Pokemon Mania Wanes, Charming Movie Sequel Arrives". Los Angeles Times. ^ "2000 23rd Hastings Bad Cinema Society Stinkers Awards". Stinkers Bad Movie Awards. Los Angeles Times. Archived from the original on October 17, 2006. Retrieved July 8, 2013. ^ "Austriancharts.at – Soundtrack – Pokémon 2 - The Power Of One" (in German). Hung Medien. Retrieved August 9, 2013. ^ "Swisscharts.com – Soundtrack – Pokémon 2 - The Power Of One". Hung Medien. Retrieved August 9, 2013. ^ "Pokemon 2000: The Power of One - Original Soundtrack". Billboard. Retrieved November 8, 2011. ^ Dan Amira (August 12, 2011). "The Mystery of Herman Cain and the Donna Summer Lyrics". nymag. Retrieved December 4, 2011. ^ Devin Gordon (December 2011). "A Pizza Party with Herman Cain". gq.com. Retrieved December 9, 2011. ^ "2000 Sydney Closing Ceremony Music List". olympicceremonies.wordpress.com. Retrieved December 4, 2011. ^ David A. Graham (December 3, 2011). "Cain Quotes 'Pokémon' Movie in Final Speech". thedailybeast.com. Retrieved December 9, 2011.